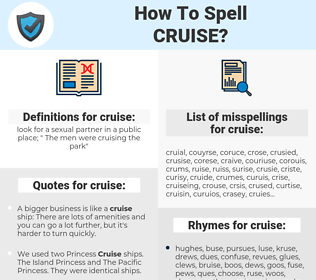 What are the misspellings for cruise? What are the common mistypes for cruise? What is the definition of cruise? What does the abbreviation cruise mean? What are the quotes for cruise? What are the rhymes for cruise? What are the translations for cruise? 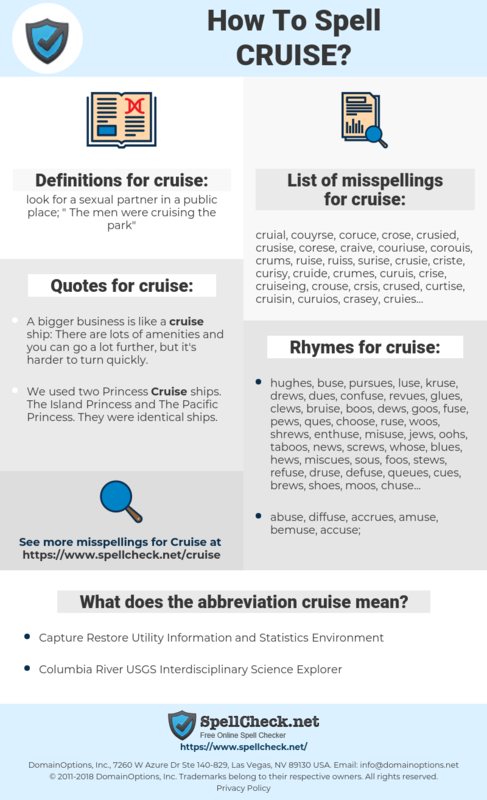 What are the common typos for cruise? This graph shows how "cruise" have occurred between 1800 and 2008 in a corpus of English books. 巡航, 游轮, 邮輪, 巡弋, 游弋, 驾艇, 航游. cruise, rondvaart, kruisvlucht, patrouilleren, surveilleren, een cruise maken, rondrijden. rouler, croiser, voler, naviguer, croisière, être en croisière, être en maraude. Fahrt, kreuzen, Kreuzfahrt, Rundfahrt, Seereise, herumfahren, mit Reisegeschwindigkeit fliegen oder fahren, Törn, Segeltörn, Schiffsreise, eine Kreuzfahrt machen. viaje, navegar, crucero, hacer un crucero, viajar en crucero. cuộc đi chơi biển bằng tàu thủy.